The problem with spending several movies playing one of the most famous characters of franchise cinema is that filmgoers may forever associate you with that one role. Take Hugh Jackman, who despite his continued insistence that he’s done playing Wolverine, still gets flooded with requests online for him to wield the claws once more. Similarly, you have Daniel Radcliffe, whose film career has been going pretty well in recent years, but will probably always be the kid who played Harry Potter in the eyes of a lot of fans. So while Radcliffe may not be the best or most obvious choice for next Wolverine, you could at least argue that casting him in the part would kill two birds with one stone, offering a new version of the character to replace Jackman in the mind of the public, while also giving Radcliffe a role that’s too big to be overshadowed by the Potter years. 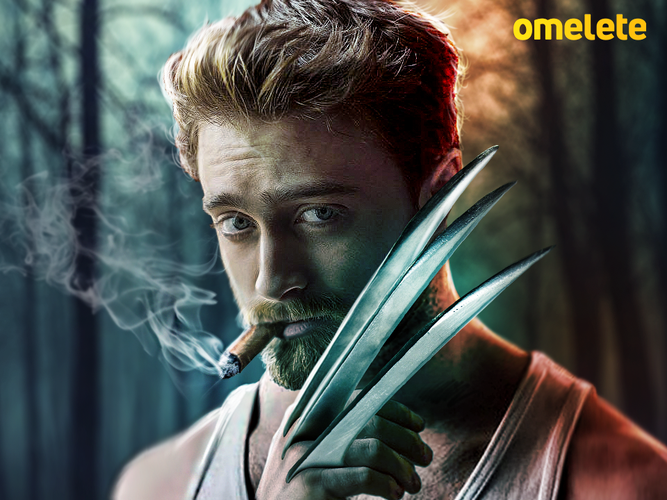 Nonetheless, we feel pretty confident in predicting that Marvel Studios has other plans in mind, but if you’d like an idea of what could’ve been (and technically still could be), Brazilian website Omelete has shared a piece of fan art featuring Radcliffe with the familiar claws protruding from his hand and a cigar in his mouth. Radcliffe himself addressed the idea of being the next Wolverine in a recent video from WIRED. In response to the popular Google search question “Is Daniel Radcliffe the new Wolverine?,” the actor joked that an upcoming Wolverine movie will see Hugh Jackman being put into a hot wash that results in Radcliffe coming out the other end. All in all, we can probably rule out Radcliffe as the next Wolverine, but with the Disney/Fox merger soon to come into effect, surely it’s only a matter of time before we find out who’s really taking over from Jackman.